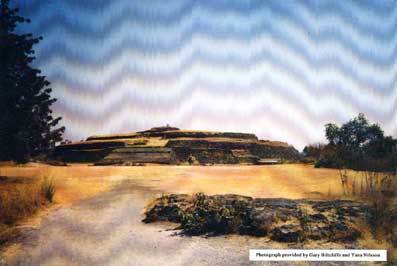 The top view is of the entire pyramid. 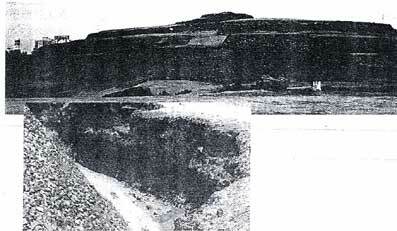 The inset view is of the encroachment of lava that, in ancient times, repeatedly covered the pyramid. 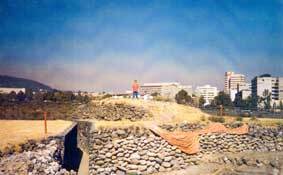 This site, accepted as among the oldest in the Valley of Mexico is dominated by a massive circular pyramid with a base 387 feet in diameter and a height of 75 feet. 50 Although parts of the large and complex site are buried by ash from volcanoes as recently as 300.A.D., other parts are buried under volcanic ash that has been dated as 7,000 years old. 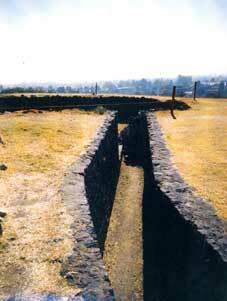 (Despite this evidence Cuicuilco is still officially dated as from 2,000 to 4,000 years old).